People can check out local wildlife wherever they are in the world with a new app that says what species of animals and plants might be nearby. The free Map of Life app dispenses with bulky field guides by allowing users to access a vast global database of species and their ranges, based on their location. Building on the Map of Life website, which provides a database of everything from bumblebees to trees, the app tells users in an instant which sets of species are likely to be found in their vicinity. Photos and text help users identify and learn more about what they see. The app also helps users create personal lists of observations and contribute those observations to scientific research and conservation efforts. “The app puts a significant proportion of our global knowledge about biodiversity in the palm of your hand, and allows you to discover and connect with biodiversity in a place, wherever you are,” said guiding force behind the Map of Life Professor Walter Jetz, a Senior Scientist in the Grand Challenges in Ecosystems and Environment group at Imperial College London and an associate professor at Yale University. 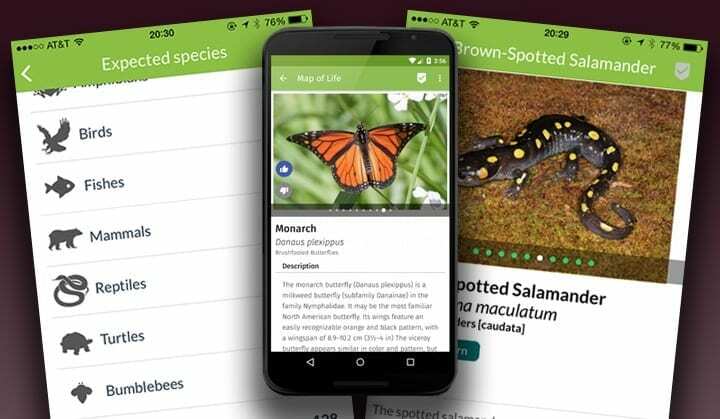 Instead of sifting through hundreds of pages in a printed field guide, naturalists get a digital guide that is already tailored to their location. With a novel modelling and mapping platform covering tens of thousands of species — everything from mammals and birds to plants, amphibians, reptiles, arthropod groups, and fish — Map of Life presents localised species information via maps, photographs, and detailed information. Thanks to a recording feature, citizen scientists everywhere can log their bird encounters and dragonfly sightings directly into the app and add to the biodiversity data available to scientists around the world. Indeed, making it easier and more globally streamlined for citizen scientists to contribute information is one of the key motivations behind creating the app. “The world is changing rapidly and species continue to disappear before we even knew where they occurred, what role they had, and how we could conserve them,” said Professor Jetz, who is involved in several global science initiatives for advancing biodiversity monitoring. April 14, 2019 - MAP: How long people in your city are expected to live NBC NewsNew neighborhood-level data on expected lifespans lets readers compare life expectancies across the U.S. in this interactive map. April 17, 2019 - Halsey Praises BTS' Success After The Group Makes Time’s 100 Most Influential People of 2019 NewsweekHalsey wrote a congratulatory letter to BTS after the seven-member South Korean boy band made Time's 100 Most Influential People list on Wednesday. April 16, 2019 - A Late Professor Digitally Scanned Notre Dame. Now His Work May Give the Cathedral New Life FortuneNotre Dame may have been gutted by Monday night's fire, but the cathedral was scanned in great detail several years ago. April 12, 2019 - South Korean boyband BTS’s new album, Map of the Soul: Persona, is released with an immense weight of expecta… Financial TimesThe album by the septet turns out to be a slight but genre-fluid affair. Do I have a realistic map for my journey of life? Breathing life into Half-Earth maps.